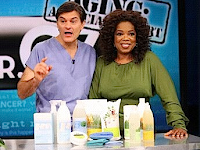 A Dr Oz television show segment on anti-aging offered advice about anti-aging. Dr Oz had a dermatologist on who was speaking about the benefits of Hyaluronic Acid. They mentioned that doctors now inject it under the skin to help to remove wrinkles. Then the doctor said if you have just purchased skin care products that have hyaluronic acid in them, that this ingredient will help your skin to hold moisture and it will look younger for about 24 hours after each use just from rubbing it on your skin. That sounds like a great idea. In looking at the ingredients of our own Beyond Organic Advanced Anti-Aging Skin Care products. Sure enough, 3 of our products have a "natural source of Hyaluronic Acid" as ingredients. Isn't that great news? You can purchase these 3 products instead of having injections under your skin from a doctor. The Anti-Aging Eye Cream, Anti-Aging AM Moisturizer and Anti-Aging Lift Serum from our own product line can give you get great results. The Lift Serum is a customer favorite. It makes a big difference when you put it on your neck, it sinks in and dries quickly...its clear and not oily at all. Wonderful! Be sure to try it for yourselves now that you know this good news about our Anti-Aging Skin Care product line.